High stakes and huge dividends! September 2012, Welscamp Heiner on the middle reaches of the Po near Ostiglia: Black-Cat test anglers and wels guides Stefan Seuß and Benjamin Gründer were joined by guests on the Po to hold a wels seminar. Summer is not one of the easiest times of year to target large wels. The high water temperatures and low water levels stifle the wels’ appetite meaning the predators can often lie motionless on the bottom for several days without feeding. In these situations, the fish wait for a massive change in their environment, such as a fall in water temperature or rising water. Heavy rainfall in the mountains brought just such a sudden rise in water levels on the Po while the water temperature quickly cooled from an initial 21 degrees to 14 degrees. For many species of fish, such a drop in temperature would mean poor catching conditions, but not for wels! The wels were suddenly very active and the browner the water became, the longer the predators stayed at the surface. On the first night of the rising water, Stefan Seuß could hear several large wels in shallow areas and reacted immediately the next morning. Together with his guests, he moved swims in search of flat bank sections overgrown with grass where the waters of the Po would gently lap in. The flooded grassland was staked out with bamboo sticks and the deadbait (bream) fished on a free line attached to a stick via a release line. The response was brutal and the stick rig (see photo in annex) created a successful giant wels alarm. 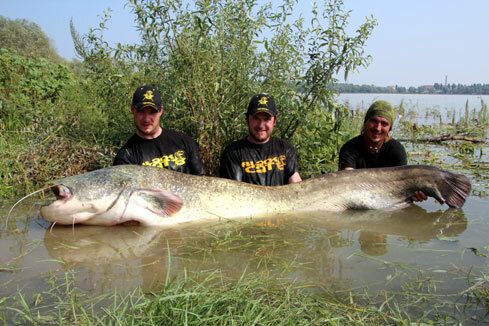 More than 30 fish were landed by the Black-Cat wels seminar participants during the rising floods, including four giants over 240 cm. The largest fish on the tarpaulin measured 252cm, 244cm, 242cm and 240cm, followed by a few “small” giant wels of between 205cm and 234cm.